Sure its different but I don't think that its an overly strong or good design. So this is what is getting built? Oh well I was hoping for some taller tower. They look interesting though. Last edited by krulltime; September 22nd, 2007 at 03:44 PM. In no particular order, sites that I pass daily and watch for progress. I don't actually know what the plans are for the parking lot here on West Broadway. Just the other day this one got the fence. A few days later they put in the trailers. You might have to look twice, but yes, the trailers are on top of the scaffolding. I'm not sure if those buildings are what's being built, in fact, I'd say no. The Cetra/Ruddy website indicates that they did massing studies to determine how to use the 500,000 sf, including the space for the law school. Well, an application for a new law school building was already issued, 6 stories, just shy of 200,000 sf by the Smith Group. Plus, the article explicitly stated that one 306,000 sf residential building is planned by the owners of the lot. No permits have been issued for 240 church, not even demolition. The lot is about 10,000 sf, so it will be a minimum of 30 stories, probably on the order of 40-45. I didn't like the look of those buildings anyway. ^Agreed. Something about those designs just screams "Look at me, look at me!" Too much fluff, not enough substance. Post a pic of a prime parking-lot development site on Curbed, and there's bound to be a groundbreaking there before long. Friday afternoon, it was the site at West Broadway and Leonard where the trailers were on top of the scaffolding. Today, it's filled with white and blue balloons and signs for New York Law School, according to not one but two intrepid correspondents. All of which led us to the rendering you see above, which shows the school's new glass-enclosed 200,000-square-foot building, set to be done by fall 2008. Click through to the PR for more on architecture firm SmithGroup's "transparent envelope" and other funky design features. New York Law School sold its Tribeca library building, making way for a new high-rise residential tower and shoring up its endowment, now one of the 10 largest in the country. The school sold the Mendik Library site on Church and Leonard Sts. in June to the Alexico Group, a development and management company known for building luxury residential towers and hotels around the city. The proceeds from the sale — estimated at about $140 million, according to the New York Post— and the sale of $135 million in triple-tax free bonds from the city filled the law school’s coffers. Its endowment is now worth about $190 million, rivaling the nation’s best-endowed law schools including Harvard, Yale, Columbia and New York University. Flush with the newfound funds, the school broke ground on a new nine-story library and classroom building to rise on the site of a Leonard St. parking lot and a former residential building at 54 Leonard St. The new 200,000 sq. ft. glass-enclosed building, designed by the SmithGroup, will rise five stories above ground and have four stories below grade, and include a cafeteria, auditorium, classrooms and a new library. The school also plans to finish renovating existing buildings by 2010. But the development that will most dramatically impact the neighborhood will be the new 240 Church St. tower, a 306,000 sq. ft. luxury residential building developed by Izak Senbahar and Simon Elias of Alexico. The team has developed several luxury projects in recent years, including the Alex Hotel in Midtown. The two recently developed 165 Charles St., a 16-story residential condo designed by Richard Meier. That West Village tower with Hudson River views was lauded by the architectural community, but evoked the ire of local residents who insisted that it and two other nearby Meier buildings changed the character of the neighborhood and cut the area off from the waterfront. 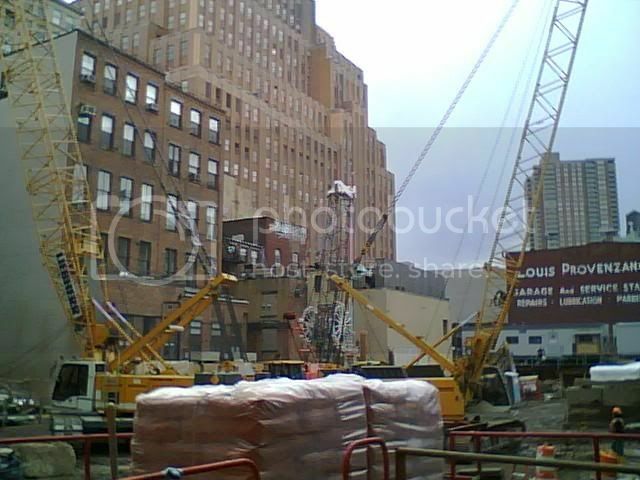 Alexico is currently at work on a 30-story luxury tower on the Upper East Side designed by Costas Kondylis. The Mendik sale has been the subject of speculation since the school first announced last summer that the parcel was on the market. Last fall, a deal with Tishman Speyer Properties fell through and since then the school has been mostly silent about who might buy the property and what a potential buyer might develop there. Even after the sale, school officials declined to say who purchased the building and for how much, despite the information being a matter of public record. Some neighbors have voiced outrage at the possibility of a high-rise tower landing in their sleepy, Tribeca neighborhood, worrying that a new influx of residents will further burden an already strained public school system. The neighborhood’s only zoned elementary school, P.S. 234, is already at 120 percent capacity. The area is mostly zoned for low-rise buildings, with heights capped at 120 feet. But the Mendik site has much looser zoning restrictions. A developer could build a 306,000 sq. ft. tower on the 12,500 sq. ft. parcel, an equation that could translate to a 50-story building, some speculate. Community Board 1, which represents the neighborhood, often struggles with developers to reduce the scale of new developments. But in this case, the board has taken a quieter approach, arguing that it has little room to influence a development that will not need to go through any kind of public review process. “We are not pleased about this at all, but the decision was made years ago to rezone that area… and put the large buildings along Church St. and that leaves us in a very unfortunate situation,” said Julie Menin, C.B. 1 chairperson. The neighborhood’s efforts would be better spent fighting for more public schools to absorb all the new children in the neighborhood, she added. Not everyone agrees that the options are so limited on an as-of-right development. Former C.B. 1 chairperson Madelyn Wils insists that developers can be influenced and she has organized a group of Leonard St. residents to fight the development. The law school could have been pressured to restrict the terms of its sale because its endowment was enriched with $135 million in public bonds, said Wils. “Given that the public is basically endowing New York Law School… it seems to me they’re taking advantage of the community,” she said. In 1995, Wils chaired the C.B. 1 committee that worked to rezone the neighborhood. Wils said the school was exempt from the zoning restrictions with the idea that it might one day grow, not so that it could sell off its property to become one of the wealthiest schools in the country. “This isn’t expanding the law school in the spirit of what was given,” she said. Wils and others in the group of residents started a fundraising campaign and has met with City Councilmember Alan Gerson to discuss their options. Now that the building is sold and the buyer is known, “we can come up with real strategy,” said Leonard St. resident Antonio Convit. Alexico will meet with the community board in the fall to discuss its development plans. Senbahar of Alexico did not return a call for comment. Excavation began last month at West Broadway and Leonard Streets, formerly the site of a parking lot, in preparation for the construction of a sparkling, glass-encased complex for New York Law School. The new 200,000-square-foot building, with five stories above ground and four more below, is part of a $190 million expansion and renovation that will nearly double the size of the school’s Tribeca campus. The new building, which will house a library, classrooms, an auditorium and more, is due to be completed in the fall of 2008, with the fully renovated campus ready for students in 2010. While school officials are celebrating what they call a “truly transformative event” in their institution’s 115-year history, some neighborhood residents say the price is too high — many stories too high. To enrich its endowment and help pay for the expansion, the school recently sold its Mendik Library property at Church and Leonard Streets, along with unused air rights from the site it is developing. Izak Senbahar and Simon Elias of the Alexico Management Group bought the Mendik Library parcel for $136.5 million. 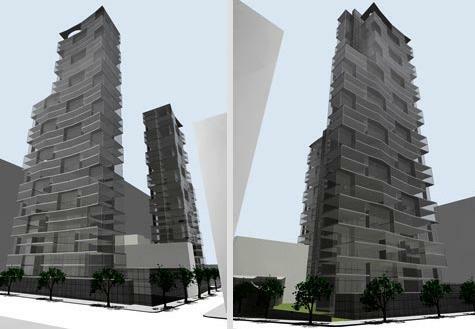 Zoning for that lot allows a 306,000-square-foot building, which could rise about 40 stories. 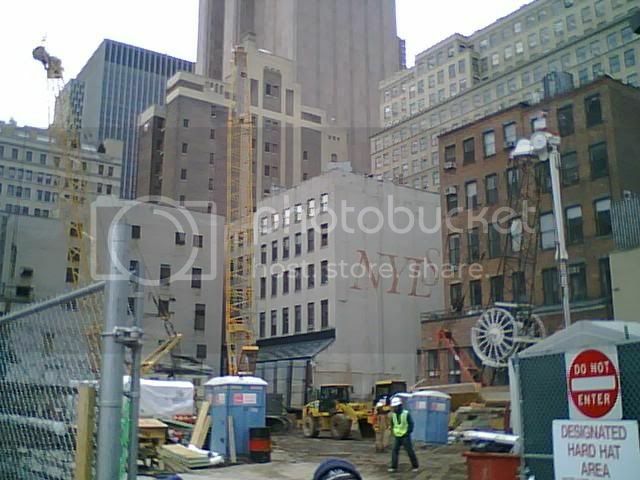 The city exempted the site when it rezoned much of Tribeca below North Moore Street in 1995, reducing the allowable size of buildings in the neighborhood. City Councilman Alan Gerson told the Trib that, hoping to influence the developer, he will explore whether other projects in Alexico’s portfolio are getting help from the city — and need approval from the City Council. “We’re going to look at possible legitimate points of leverage with respect to these developers, including all city permits and benefits,” Gerson said. “I expect that [Alexico] would want to be good neighbors and want their people moving into a welcoming situation,” he added. Among Senbahar and Elias’ properties are the Richard Meier-designed tower at 165 Charles St., the Mark Hotel on East 77th Street and an apartment tower, designed by Kostas Kondylis, under construction on East 67th Street. Alexico has not released its plans and did not return calls for comment. The law school has been criticized by some for putting its endowment — now one of the 10 richest in the country—ahead of community interests. Its coffers have been filled, in part, with $135 million in insured bonds issued through the New York City Industrial Development Agency. In a telephone interview, Richard Matasar, the school’s dean and president, vigorously defended the land sale. Any “predesigned restriction,” he said, would not give the school the resources it needs to compete with other schools and realize its goals. Income from the sale, and the city-insured bonds, were needed to secure further financing, he said. With the deal now sealed, can the developers be influenced by community pressure? Only with a local show of force, Menin and Wils asserted. I wish that something could be done with that horrible yellow and orange power station across the street from this site. It would be nice if verticle wall containing water falls were built all around it. It's funny that such a terrible law school has such a huge endowment. Not a worthy place to study? No. It's fourth tier at best and is a breeding ground for personal injury "lawyers".